Tell me about your non-for profit organization – what’s its function? 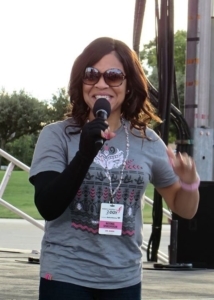 LIVE-Today Inc. is a nonprofit organization that enhances the quality of life for breast cancer survivors, especially those who suffer from lymphedema. The organization additionally contributes to the health and well-being of its recipients by providing much needed and medically necessary compression garments. The LIVE-Today Foundation seeks to provide a streamlined approach to bridge the public health needs of women suffering from lymphedema with fashionable compression garments that optimize lymphedema management in women with limited economic resources. What else will your organization provide? Of the nearly 3 million breast carcinoma survivors, it is estimated that over 40% are currently living with post-treatment lymphedema. Minorities, in particular, continue to suffer the effects of health care disparities regarding treatment, post-operative care, access, patient navigation services, social and financial community health and public health programs and services. We also provide an Educational toolkit that is used to educate physicians, healthcare providers and patients who all need greater awareness of the physical and psychosocial effects of lymphedema in breast cancer survivors. Additionally, we plan to educate patient navigators. Nurses have unique opportunities to serve as advocates for reducing perceived marginalization and promoting effective self-care and other activities that promote psychological well-being and reduce physical deterioration. Patients with lymphedema have chronic, progressive swelling, pain, recurrent infections, and a significantly decreased quality of life. The swelling can progress to gigantic proportions causing gross disfigurement with severe detrimental effects. In addition, lymphedema is a significant source of biomedical expenditures with one recent study demonstrating a more than $10,000 increase in the annual treatment costs of cancer survivors with lymphedema as compared with those without lymphedema. Treatment for lymphedema remains suboptimal and is, in most cases palliative with a goal of preventing disease progression rather than a cure. Medical and surgical treatments have been reported but in general, these therapies have been disappointing and the results sometimes difficult to reproduce. In most instances, patients are treated with life-long physical therapy with manual lymphatic drainage and require tight fitting, uncomfortable elastic garments. Due to the expense, time, and discomfort associated with these treatments, there is a high degree of non-compliance and associated disease progression.